In the early hours of Thursday morning, at 2.15am, the Israeli army invaded the village of Ni’lin and kidnapped two young men from their family homes. Mohammad Waed Khawaja (22), and Mohammad Ratib Khawaja (20), were each forcibly arrested, blindfolded, handcuffed, and taken away. The soldiers arrived on foot from the nearby fields and simultaneously surrounded the houses before entering. The army arrived at the house of Mohammad Waed Khawaja, with their faces painted black, and screamed his name ordering him to come out. 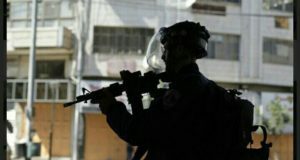 Before the family could respond, the army smashed the windows and the entrance door of the house and 11 soldiers forcibly entered, with 30 remaining outside. The 13 members of the family were woken up, harassed and forced into one room of the house. 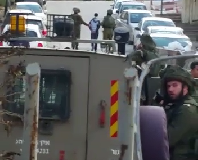 The terrified family attempted to question why Mohammad was being arrested but the soldiers refused to respond. Twenty minutes after the soldiers entered, they left with Mohammad who was blindfolded and handcuffed and led away through the field on foot. At the house of Mohammad Ratib Khawaja, one of his sisters heard the soldiers arriving and alerted the family. To prevent the soldiers causing damage to the door, it was opened by the family and they employed the same tactics, forcing the family into the living room and searching the lower apartment of the house. The soldiers then went to the second floor where Mohammad lives with his heavily pregnant wife and interrogated him alone for 10 minutes. Once again, the soldiers refused to give any reason to the family for the invasion and arrest of Mohammad, who was also subject to blindfold and handcuffs. According to the neighbours, the soldiers had been searching the area previous to the invasion of the house. According to the family of Mohammad Ratib Khawaja, he was taken Ofer prisoner camp, outside Ramallah, where the inmates are held in tents. It is unknown where Mohammad Waed Khawaja was taken. 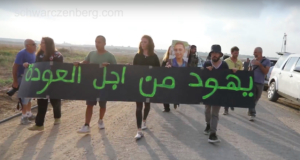 These arrests are just the latest of many arrests in Ni’lin, where it is commonplace for the army to invade during the night and harass residents. According to Adalah, The Legal Center for Arab Minority Rights in Israel, there were 11,000 Palestinian prisoners held in Israeli jails as of April 2008.